In late 19th century Glasgow the area bounded by Stockwell Street and Saltmarket, the Trongate to the north and the Clyde to the south was referred to as "District 14". In 1889 a report by Glasgow's Philosophical Society described this area as having 7,150 people living in 1,308 houses and sharing 100 water closets. Of the 99 common lodging houses in the city, 63 of them were in this small district. The city's medical officer in a report on the area described the slums that people here were living in as "filthy beyond measure....High Street, Saltmarket, Briggait are all sanitary evils....For years the population of many thousands has been added to Glasgow by immigrants without a single house being built to receive them." A correspondent for the Glasgow Herald complained about the "public houses...doing a roaring trade". Managing to then offend several diverse groups of people at once he continues "A graphic sketch of the conditions around the High Street, Saltmarket, Bridgegate and Trongate, between the hours of midnight on Saturday and six o'clock on Sunday morning would astonish many of our featherbed philanthropists who devote so much thought into bettering the conditions of Australian savages." So what made my great-great-great grandparents move to this area at that time, and stay here for the next 50 years to bring up their family? 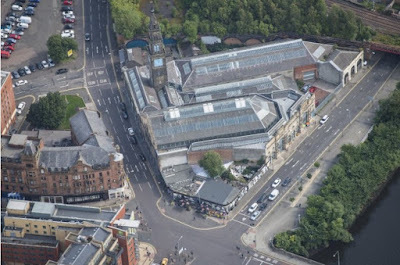 The Bridgegate (or Briggait) is one of the oldest streets in Glasgow, leading to the first major bridge over the River Clyde and then south towards the Gorbals village. “Gait” is from the old Scots word for “the way to", rather than meaning “gate” in the modern sense. In the 1100s the street later known as the Bridgegate was a track leading to a simple bridge, referred to in William Wallace's time as a "brig o' tree" (wooden bridge). In 1297 Wallace allegedly rode from Ayr and defeated a small English force in the Battle of the Bell O' the Brae near to Glasgow Cathedral, at the top of what is now High Street. Blind Harry tells how Wallace brought his forces to "Glasgow bryg, that byyggit was of tre", dividing his forces with some going straight up High Street (known at one time as "Bell O' the Brae") to Glasgow Castle, and the others coming around from the rear, up Drygate and across the bridge over the Molendinar Burn. Drygate is often called the oldest street in Glasgow, pre-dating the cathedral. Druids apparently used to worship on the hill of Fir Park, now the necropolis. The word"dry" is a pagan word, of German origin, meaning priest. So although it is known now as the home of a brewery, Drygate is the "priests' way". 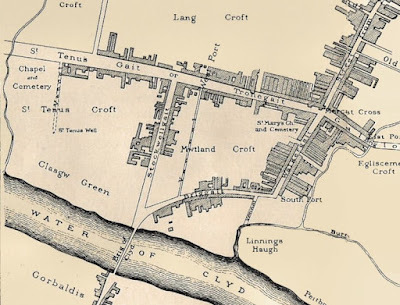 The wooden bridge over the Clyde was replaced by the first stone bridge across the river in the time of Bishop Rae (1335-1367), around 1350, at the bottom of what is now Stockwell Street, called Glasgow Bridge for around 500 years. Stockwell Street is named after a well with a wooden stock that once stood here. Prior to 1345 the street was called Fishergait, as it led to the salmon fishers' village on the banks of the Clyde. In later times one of Glasgow's first music halls, The Scotia Variety Theatre, opened on Stockwell Street. Harry Lauder made his first stage appearances here. In 1895 high unemployment in the area meant that the Scotia Theatre (and also the Gaiety on Sauchiehall Street) was operating a soup kitchen during the day to provide some food to local residents. Later this music hall became the Metropole Theatre, managed at the start of the 20th century by Arthur Jefferson. His son used to help him out on occasion in the theatre, but made his own stage debut around the corner in The Panopticon, at the age of sixteen. Travelling to America in the same ship as Charlie Chaplin as part of Fred Karno's vaudeville troupe, this young man made his name there, as Stan Laurel. In the above map from the 16th century Glasgow Cross was then called Mercat Cross (market cross). This was where the tron, or weighing beam, was found; where goods were weighed and taxed. Gallowgate led to the gallows, which were out near where Barrack Street now stands, until they were moved in 1765. On the map above Saltmarket is called Walkergait, from the waulkers, that worked here, no doubt preparing their cloth with “waulking songs” which are now only associated with Scottish island communities. The later name “Saltmarket” came from 1650, when the market selling salt for cuing salmon operated here. The Saltmarket and Bridgegate became fashionable areas for the city's wealthy merchants to set up home. In 1650 Cromwell stayed here when he visited Scotland. In 1759 a certain Agnes Craig was born on Saltmarket, fifth child of respected physician Andrew Craig, she is better know under her married name, Agnes MacLehose, or through the alias she and Robert Burns communicated – Clarinda. 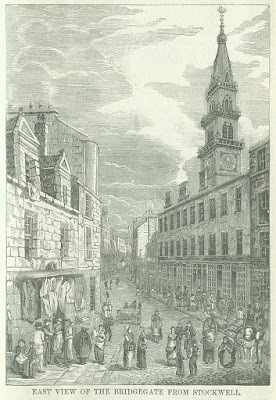 Around 1710 the city's first post office was on Saltmarket, in 1763 James Watt ran a shop here and Peter Tait's Glasgow Journal, forerunner to the Glasgow Herald, was run from number 11. Entertainment on Saltmarket came from the old show grounds and circus building near the court buildings. It was also home to the City and Adelphi theatres. Originally the Bridgegate (or Briggait) was lined with the mansions of wealthy merchants. 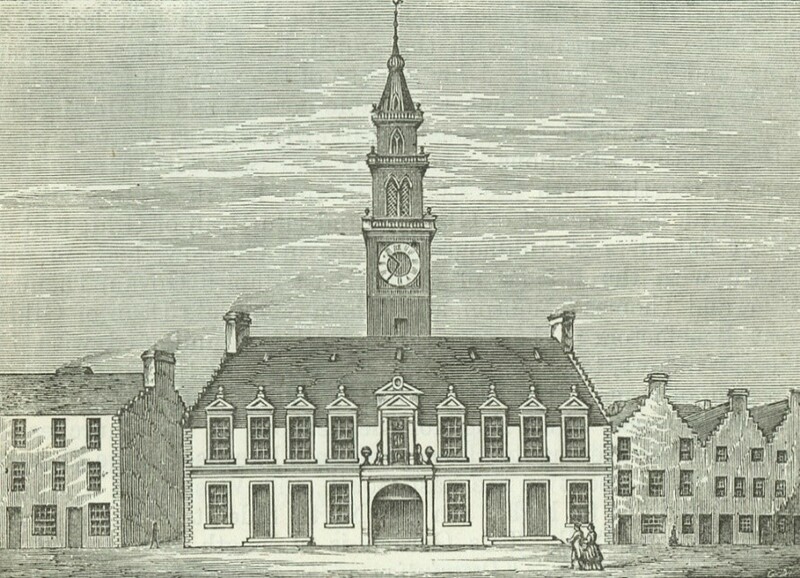 It was therefore a natural place for them to build their original Merchants’ Hall (or Hospital as it was known initially, in the old sense of the word, a place for giving out alms). Built in the early 1600s on the Bridgegate, it was re-built in 1659 on the same site. Designed by Sir William Bruce, the distinctive tower, which was completed six years later, is all that survives from that building. The ground floor of the Merchants’ Hall here initially provided apartments for pensioners of the hospital, with the large hall being found on the first floor. In the late 18th century the ground floor was converted into four shops, and houses to be let out for rent. As the area became increasingly less salubrious, the Merchants House of Glasgow planned to build a new hall elsewhere and their building was largely demolished in 1818, replaced with tenements on the same site. As part of this deal, signed in 1817 for the sale of their building and land for £7500, the steeple was to be preserved and any tenements built were to be restricted in height to allow it still to be admired. The steeple is 164 feet tall, and still topped with the emblem of the Merchants’ House, the ship on a globe. Lord Dean of the Merchants' House at the time, James Ewing was not shy about explaining why he felt it was time for the organisation to move away from their old building. "A very material change, however, has since taken place...The Bridgegate, which was then the most respectable and fashionable part of the Town, has now become the residence chiefly of the inferior classes, with an awkward access, and a still more objectionable vicinity." 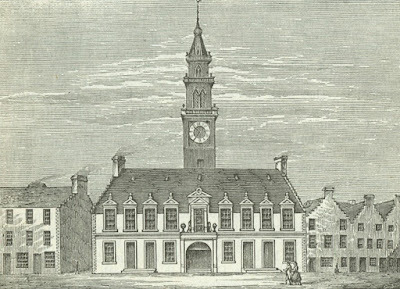 The arrival of a public slaughterhouse on Saltmarket in 1744, bleachfields and court buildings reflected the changing use of the area over the years. Over time the many fine mansions had been sub-divided or replaced by tenement buildings, housing the workers required for the new industries sprouting up in the city. The well to-do were heading for the clean air in the west of the growing city. In the 18th century immigration from Ireland to the west of Scotland was not unusual, many of those coming to Ayrshire, Lanarkshire and Glasgow at that time were skilled cotton workers, largely from Protestant communities in the north of Ireland. In Glasgow many of these people settled in the Calton area, centre for handloom weaving at that time. Over the next hundred years the numbers of Irish immigrants would rise steeply, just as workers poured into the city from the Highlands and Lowlands of Scotland. Around the mid-1700s it is widely quoted that Glasgow had only 39 Catholics recorded as living in the city, but 43 anti-Catholic clubs. In the early 19th century many people arriving on the Broomielaw from Ireland were escaping poverty and starvation, and took on some of the lowest paid, often physical work in the city, particularly working on the bustling docks, building roads, railways and canals or in mining. 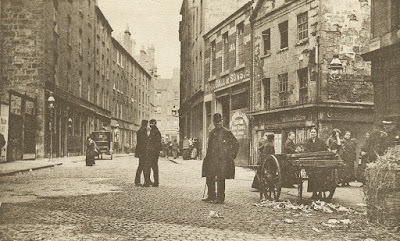 The area around Saltmarket and Bridgegate provided some of the cheapest accommodation, from lodging houses to crowded tenements. After the Irish famine of 1845, the numbers of people arriving in Glasgow rose dramatically, at a time when Glasgow was one of the most rapidly growing cities in the world. In 1831 the population of Glasgow was 220,000. By 1861 there were 460,000 Glaswegians. The Catholic Church set in place the first Catholic priest in Glasgow since the Reformation in the early 1800s and by 1816 work had begun on St Andrew's Cathedral on a prominent site by the Clyde, just along from the bottom of Stockwell Street. Much of the funding for this building came from weekly subscriptions from some of the city's poorest people. The same criticisms that are levelled against recent immigrants to the city were raised against the impoverished Irish residents of the city at that time. Letters in the Glasgow Herald and sermons from Church of Scotland pulpits of the day complain about diseases they are bringing to the city (typhus outbreaks were common in the cramped and insanitary housing conditions), about crime and drunkeness caused by these new arrivals, and criticising them for coming to Scotland to claim Poor Law assistance and charity, even though as new arrivals in the city they were not entitled to many of these resources. When Sir Archibald Alison gave his inaugural address as Rector of the University of Glasgow in 1850, he choose to criticise the religion of many of these new arrivals in his speech titled "The Intolerance of the Catholic Church Through the Ages". I imagine Polish, Roma and Muslim immigrants to Britain would recognise the atmosphere being created by these pronouncements. Orangemen from the old country could also get together with like minded people on arriving in Glasgow. The Brunswick Loyal Orange Lodge was the first one set up in Glasgow, in 1813. Many of the first Orange Lodges were set up by Glaswegians returning from fighting in Ireland as part of the Fencibles forces, set up to combat the 1798 rebellion by the United Irishmen, led by (the Protestant) Wolfe Tone. The first Orange walk in the city is recorded by John Burrowes in his book "The Irish" as taking place on 12th July 1821, and ending in a "fracas" near Glasgow Cross, where the statue of King Billy used to sit. Over the years many more inter-religious flashpoints would occur, but much of the divide was less overt. It was widely known that certain factories or shipyards would not employ Catholics, and on the other side of my family, when my great-grandfather came to Glasgow from Ayrshire, I have no doubts that his standing in his local Masonic Lodge helped him into work, and promotion, at Harland and Wolff's shipyards in Govan. By 1824 an “Old Clothes Market” had been set up in Scanlon’s Close south of the Bridgegate and the street was soon lined with shops and barrows selling old clothes. The clothes market, known colloquially as "Paddy's Market" due to the large numbers of Irish people living and working here, can be seen on this map of 1847, that pre-dates the current Briggait building. 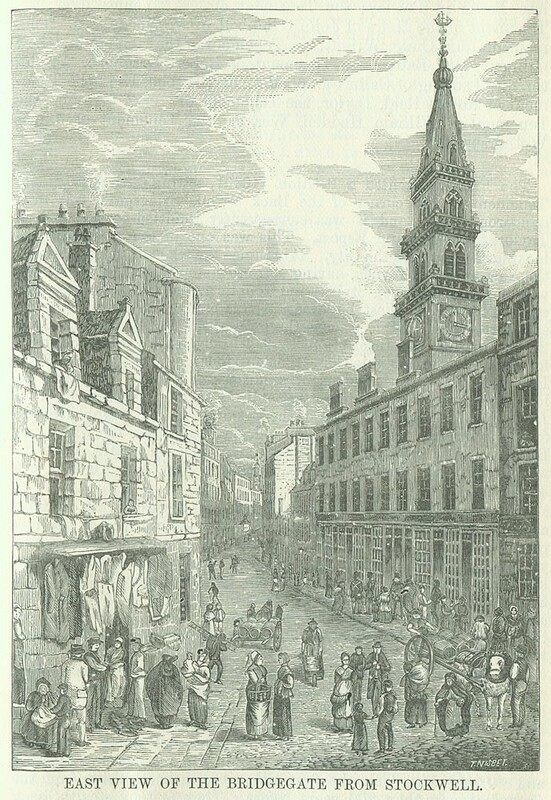 The merchants’ steeple here is at the northern end of Guildry Court, a short street with tenements on either side (click to expand). 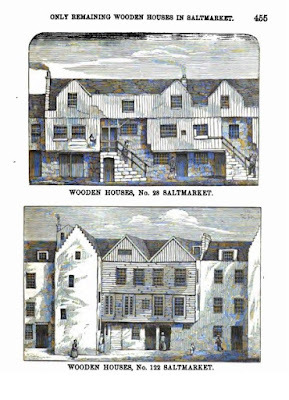 The streets were soon lined by shops, largely run by the new new Irish immigrants. By the end of the 19th century the tenements of the Saltmarket were notorious for their dilapidated state and the crowded, unhealthy conditions. At that time the housing still followed the medeival alignment. On Saltmarket tenements of various ages lined the street, with closes extending perpendicular to the street, and further rows of houses found behind, where we would expect a back green to be behind a tenement now. These were some of the worst slums in Britain. This led the city improvement trust to demolish many of the old 17th century buildings here. The current tenements on Saltmarket date from the 1880s, with their crow-steps, gables and chimneys copying the style of the demolished buildings. 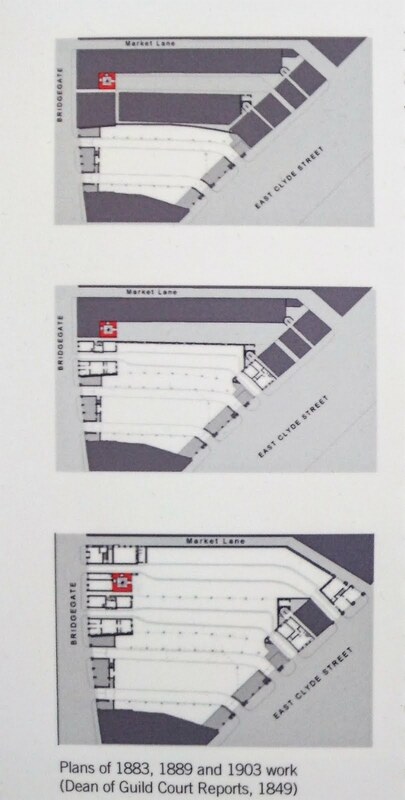 The arrival of the Union Railway in 1864 again drastically altered the area with the slaughterhouses and old clothes market building being swept away (though the market lived on) and an engine shed being built where King Street car park not sits. The line came across the Clyde from the south, over the Bridgegate and swung left towards St Enoch Station, across Stockwell Street. New tenement buildings filled in some gaps, but the area became more of a backwater than before. Writing in 1873 JFS Gordon in his book "Glasghu facies" complains about the changing face of the Bridgegate. He bemoans the fact that the "Tobacco lords, princely merchants and fashionable ladies" have moved on, "their places are filled with a new and strange race of traders from The Emerald Isle". He continues that the"stately mansions have either been demolished, or are turned into Whisky Shops, Ham-Stores, Old-Clothes-Emporiums, Brokers'-Stalls and common Lodging-Houses." Reporting that there were many Irish lodging houses on the Bridgegate, he mentions the The Londonderry Hotel "for the Orangemen", whilst the nearby The Emerald Isle tavern is "for the Papists". At this time he comments also that the street was rightly known “for the quality of its tripe, potted meat and cow heel”, for its public houses, but notorious also for being wild on a Saturday night. The reason his writing at this time grabs my attention, is it was the time my ancestors were living in the Saltmarket and the Bridgegate. The year he was writing, 1873, was also when a new trade arrived in the area, the fish market was built on the Bridgegate. 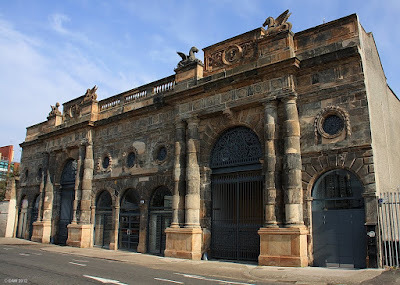 In 1873 the fish market was built, with a grand French Renaissance style frontage facing the Clyde on East Clyde Street, designed by architects Clarke and Bell. The cast iron galleried, glass-roofed market hall within served as the city’s fish market for over 100 years, until 1977. To the east of the market hall at that time still stood rows of tenements running perpendicular to Bridgegate, including Guildry Court. The fish market had been a success, and was extended in size in 1886, with a low, utilitarian hall pushing eastwards, towards the tenements on the western side of Guildry Court. Then again in 1903 further expansion was required and the western block of Guildry Cort tenements were demolished. In 1914 the final addition to the market saw the last block of tenements demolished and replaced with a two storey block of offices on Bridgegate, with a corner turret. The Merchants’ Steeple was again all that remained of the old landscape, now with the fish market built completely around it. On the 1897 map above one row of tenements remains on the block, at the eastern side of the fish market, noteworthy to me as my great-great grandad lived here and his son-in-law ran a confectioners on the Bridgegate in the ground floor shop. Also of note there are seven public houses marked on this one block in 1897, with many more nearby. "Peter, I Will Make You Fish Merchant to Men"
Patrick Donnelly (also known as Peter), was born in Roscommon, in Ireland, in 1826. Like many other Irishmen and woman he moved to Scotland shortly afterwards, where he married an Ann McCartney born Old Cumnock, Ayrshire, the daughter of handloom weavers. In 1871 and 1880 he is recorded as living at 122 Saltmarket, which at that time was one of the last remaining wooden tenement buildings on the street (as mentioned above). Shortly afterwards it was replaced by the sandstone building that stands there now and the closes behind it largely cleared. Like many Irishmen that moved to the area, and many immigrants coming to the city ever since, unable to get into the closed shop of local industries, he opened his own business. In 1871 he was a “dealer in fruit”, 1880 “general dealer", running shops in the area at this time. Patrick (known as Peter) Donnelly's son, Peter Donnelly (usually called Patrick), was born in 1860. In 1880 he was living at 122 Saltmarket with his parents. He married an Annie McLuskey in 1880, who was born in Paisley to Irish parents in 1861. Peter was at times a tinsmith (a tinker), a labourer and worked later in a china wholesalers shop with Annie for a while at 107 Bridgegate. In 1883 his you family were living at 128 Saltmarket and by 1885 he was running a confectioners shop at 131 Bridgegate, just east of the fish market entrance. In 1892, leaving his young family at home, he left for Philidelphia and died there 2 years later from TB, leaving Annie to bring up her children alone. Annie’s father Patrick (also known as Peter) McCluskey came from Ballycastle in County Antrim.. In 1861, not long after arriving from Ireland, he was working in Ayrshire as a coal miner. He then moved to Paisley, working as a labourer and a bricklayer. In 1881 he is living at 109 Bridgegate. In 1884 he is recorded as a “provisions dealer/victualler”, renting a flat and shop at 139 Bridgegate. The flat he is renting faced onto the Bridgegate in front of the Merchants' Steeple and was later demolished as the fish market expanded. My granny always described him as the "first butter, ham and egg merchant" in the west of Scotland and at this time it is how some shops across the city began describing themselves. He and his family seem to have a hand in a few shops, with other McLuskey's running butter, ham and egg shops on Bridgegate and further west on Stobcross Road. 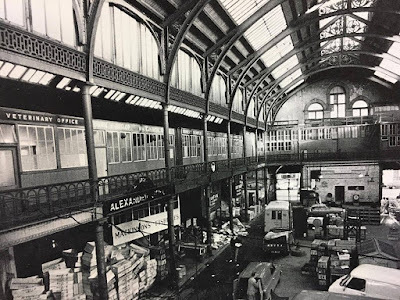 A couple of years later, the successful fish market catches his eye and by the mid-1880s he is recorded as a fish merchant, running one of the shops on the Bridgegate just next to the main fish market entrance. In 1891 he is living with his daughter Annie and her children at 1 Guildry Court, and he and his daughter are both working as fishmongers, living practically above the shop in what must have been pungent accommodation. As well as her father Peter McCluskey, her younger brother Patrick (in a break from tradition, known as Paddy) 17 years her younger was staying there, as were her children Peter S. Donnelly (always known as Peter, born 1883), his big sister Annie and two younger siblings. Another daughter, Rose, died in infancy, like many other children of that time. 10 years later Peter S. Donnelly had moved out, Paddy was 22 and working as a “vanman” ferrying goods around, and the younger children Katie and John Francis were still at home. Daughter Annie was now married to John McGinty, a bookie and in later years their daughter (Annie McGinty, always known as Annie McGinty, even after she became Annie Taylor) continued the family tradition, working as a bookie's runner. One of her two sons, Kenny Taylor, eventually worked as a cooper but in his younger days was a decent footballer. Before he played as a winger for Clyde FC he had got himself into the papers for managing to score three goals direct from corners as a player in the Juniors. From 1896-1898, Peter McCluskey continues running a fish merchant’s shop at 151 Bridgegate and the family are all staying in a flat at 137 Bridgegate. Annie continued this trade after her father's death, running the shop for at least the next 20 years. Her fish merchant's shop at 151 Bridgegate was not actually in the old Briggait fish market which was number 141, but next door, between it and the current Clutha Vaults pub. At this time there were 9 shop fronts either side of the Bridgegate entrance to the fish market. These were all fish merchants and fish curers, some also specialising in rabbit and game. Few of the shops here seem to have been run by women and I get the impression from my granny's tales that she wasn't a woman to mess about. She was still living at 137 Bridgegate until 1903, when these last remaining tenements on the block were demolished to further expand the fish market building. Whilst her son Peter and his young family were living at 153 Stockwell Street in the newly built tenement from 1905, in 1903 Annie and her family had moved just around the corner to 132 Stockwell Street, a few doors south of 116 Stockwell Street, where the Metropole Theatre stood (roughly where the current Scotia Bar sits). Perhaps a teenage Stan Laurel took her ticket at the door of his dad's theatre as she went inside. They lived here for at least the next 10 years, and in time various family members gravitated a couple of hundred yards south to spend the rest of their days in the Gorbals. On researching this branch of my family they seem to have been a very tight-knit group, marrying people from the same few nearby streets and never moving more than a couple of streets away over a 50 year period. Other nieces and nephews married into the Corrigan family that still run fish-shops in the city, or to the Dunne's who ran a haulage business from Bridgegate into the 1960s. Religion was never spoken about to me as any great bone of contention, but it was always an important part of my granny's family identity. Her father narrowly avoided being murdered in 1920 after relatives he had been visiting a few days earlier in Ireland were burned out of their home by Black and Tans. He had started down the road of training for the priesthood before he changed tack and opened a shop as a dentist in the Gorbals in the early 1900s (you did not need a dental degree in those days). To his mother, fish-merchant Annie Donnelly, religion was important and she traveled widely during her lifetime, three times to Rome and once to the Holy Lands. Although my granny married a protestant without anybody batting an eyelid, she told me about her aunt, another Annie Donnelly, who stayed above the Citizens Theatre on Gorbals Main Street. After having seven children (Kathleen, Mary, John, Ann, Peter, Alec and Helen), her mother-in-law "stole away her 8th child", when he was only 3 days old, swearing that she was going to have one grandchild brought up a Protestant - he stands out among his siblings as being named William. Wandering about these streets today, it is an unecessarily neglected and shabby part of town, with gap sites and scrappy car parks lying undeveloped, right in the centre of one of Britain's largest cities. The closure of Paddy's Market nine years ago was meant to part of a wider regeneration scheme in the area. The imagination of the city council on redevelopment does not seem to stretch much beyond shopping malls when it comes to granting planning permission, and as these seem to be becoming yesterday's idea, no grand vision to re-invigorate a once wild and bustling part of town seems to be on the table. The old fish market building, now branded as The Briggait, seems to be thriving as a home for visual artists and cultural organisations, and regularly hosts exhibitions and food festivals in the old market hall. Glasgow's current fish market shares a building in Blochairn with the city's wholesale fruit market, and is a decidedly functional place. On trying to find out more about these relatives I re-discovered the place where Annie Donnelly, who ran her shop at the fish market for so many years, had been buried in St Kentigern's cemetery. Her brother, Patrick McLuskey, and later Annie herself lived with my great-grandad Peter Donnelly in their later years and as they are all so fondly remembered by many family members, it was nice to get a headstone back in place on their grave. Gone but not forgotten. Thanks Paul an excellent piece. We were brought up in Collins St, we played in the ruins of Duke St prison when it was being demolished. The Molendinar burn was stil open in those days. My brother Colin moved into one of the Drygate flats, good community spirit there.